The U.S. Navy has awarded Huntington Ingalls Industries (NYSE: HII) a potential $5.25B contract and General Dynamics’ (NYSE: GD) Bath Iron Works subsidiary a potential $4.03B contract to construct new Arleigh Burke-class guided missile destroyer ships. 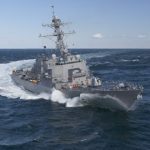 Under the contract, HII will build up to six DDG 51 ships while Bath Iron Works will manufacture up to four vessels, the Defense Department said Thursday. The fixed-price-incentive, firm-target-multiyear contracts also include options for engineering change proposals, design budgeting requirements and post-delivery availabilities. HII’s contract has a base value of $5.1B, while Bath Iron Works’ contract has a $3.9B initial value. The two companies will perform work in various locations across the continental U.S., with Bath Iron Works’ duties expected to be done by June 2028 and HII’s by April 2029. The Naval Sea Systems Command received two offers for the DDG 51 construction project and procured the agreements through a limited competition between HII and Bath Iron Works.